Fiction-Food Café: Chocobo Curry | "Final Fantasy"
Chocobo Curry | "Final Fantasy"
Taki-san's entry photo on the left, cafe menu photo on the right. Image from "Final Fantasy" blog. Today I'm sharing a special dish in celebration of Square Enix's recent(ish) E3 announcement of the "Final Fantasy VII" remake for PS4! 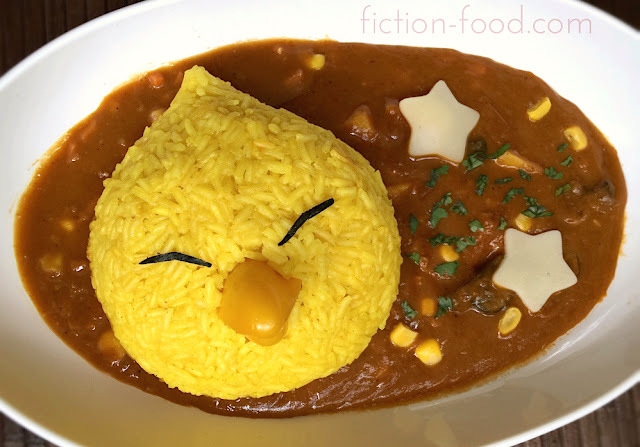 This recipe is inspired by the "Fat Chocobo Head Curry" (or "Debu Chocobo Heddo Kare" in Japanese) available at the "Final Fantasy XIV" themed "Eorzea Cafe" in Akihabara in Japan. 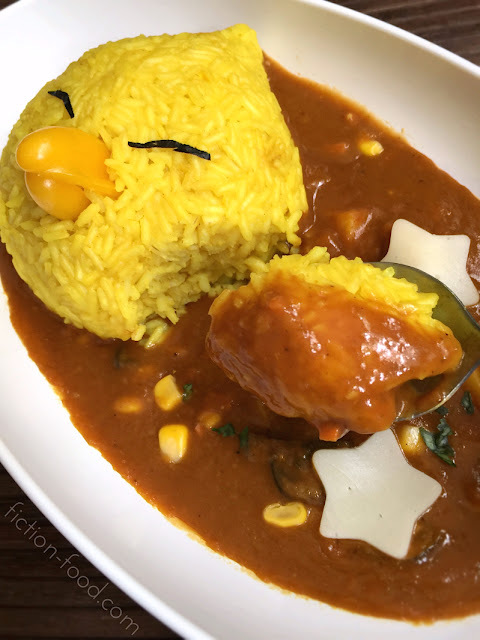 The cafe held a menu item design contest and this curry was based on a winning entry by Taki-san (you can check out the winning entry post here on the N. Am. "Final Fantasy" blog). The full cafe menu can be viewed here. Chocobos are a race of large, flightless birds that appear throughout the "Final Fantasy" franchise (you can check out my chocobo marshmallow peeps here). Note: The recipe below is for making the curry and yellow rice from scratch, but you can also simplify it by buying curry cubes (I like the Vermont curry brand) and a bag of yellow/saffron rice (Mahatma brand is great). For the rice, simply omit the butter called for on the package directions as it might make the rice less able to stick together when forming the chocobo head, though I'm just guessing. 1. Curry: In a heavy bottomed pot on medium heat, melt & lightly brown the butter. Stir in the onion & cook until tender & golden. Add the garlic & ginger & cook for a minute more. In a little bowl, whisk together the flour, curry powder, & cayenne. Add this to the pot & stir to incorporate & let cook, stirring, until browned. Next, stir in the tomato paste until well combined & cook for a minute or 2 more. Pour in the chilled broth along with the grated apple & stir until everything is smooth & mixed well. 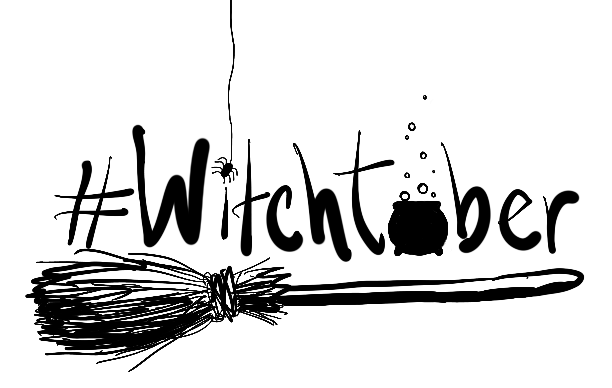 Bring the mixture to a boil & let cook until thickened. 2. Reduce the heat & either use an immersion blender to blend everything together or pour the mixture into a standing blender, blend, & then pour back into the pot (blending is optional, but it makes for a smoother sauce). Skim the top of the mixture with a slotted spoon or small strainer to remove any foam. Next, add the potato, carrot, & mushroom bits, cover, & simmer for about 20 minutes or until the potatoes & carrots are tender. Turn off the heat & stir in the corn. 3. Rice: Combine the ground saffron with the hot water & let sit for several minutes until the water turns deep yellow/kinda orange. Put the rice in a large pot or the bowl of your rice cooker & run water into the pot from the sink, enough to cover the rice. Rub the rice with your hands until the water gets cloudy & then drain. Rinse, rub, & drain again. Pour the saffron water over the rice & then add the salt & chicken stock. If using a rice cooker, close the lid & cook. If cooking on the stove, bring the pot to a boil & then turn down to a simmer. Cover cook for about 20 minutes. Uncover & fluff with a fork (if the rice isn't cooked through, add a little more water, cover & cook a bit longer). Remove from heat & let the rice sit until cool enough to handle. Alternative: You can mix curry powder & chicken bullion powder with a little hot water to dissolve & then stir into already cooked white rice. The rice will become yellow, but paler than the saffron rice. 4. 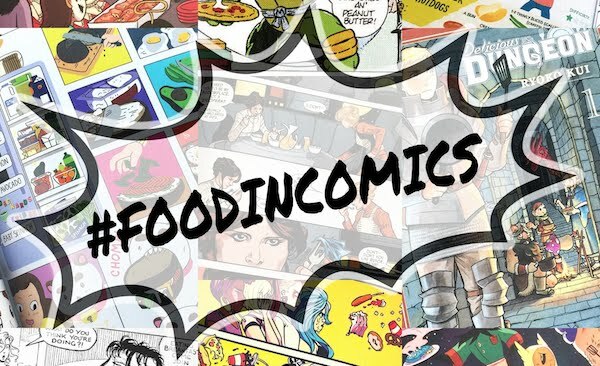 Assembling: Scoop about a cupful (or less if you're not that hungry!) of the cooked yellow rice onto a large sheet of plastic wrap. Gather up the wrap & twist until the rice is squished into a ball. Squeeze the wrapped rice with your hands to make the ball tighter & then unwrap the plastic. Wet your finger tips & slightly flatten the ball to resemble the chocobo head (wetting your fingers again each time the rice begins to stick) & create a little point at the top of the head (or try to do this using the plastic wrap as much as possible, it's less potentially sticky that way). Lay the head on the plastic wrap & cut the yellow bell pepper near its curved bottom into 2 large beak shapes (remember, you'll want the beak to be larger than mine). Use your wet fingers to create an indentation on the center of the rice for the beak & then gently press the upper & lower beak pieces into place. 5. Scoop a generous ladleful or 2 of curry into a long curry dish, pushing all of the potato & mushrooms pieces to the right side. 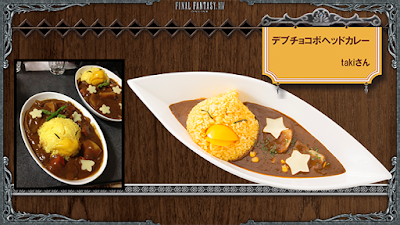 With wet fingers, place the chocobo head on the left side of the dish. Use your small scissors to cut 2 small, thin, curved strips from the seaweed sheet & place them on the chocobo head for the closed eyes. 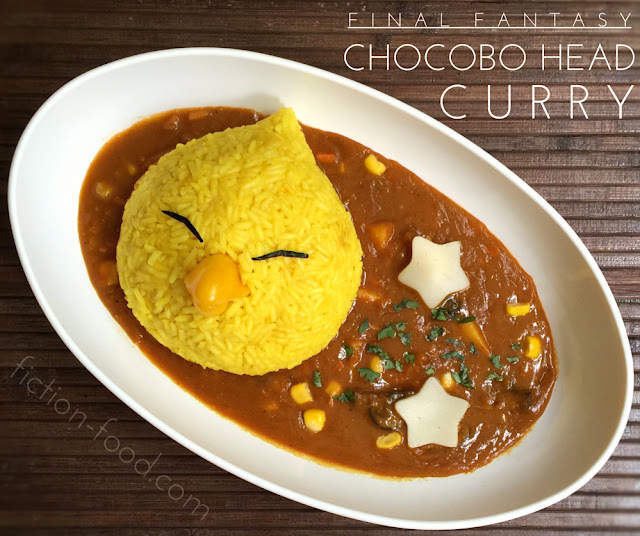 Using the small star cutter, cut out a few stars from the cheese slice & place the stars on top of the curry to the right of the chocobo head. Lastly, sprinkle a little of the finely chopped fresh chives over the curry & you're all done! This recipe makes enough for 2 servings or so, depending on the size of your dishes & how much you want to eat. 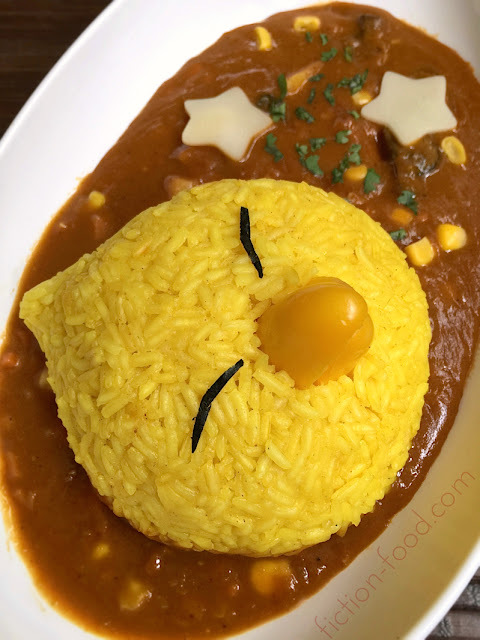 The chocobo rice head would also be great in a bento! Sooo cute!! I love it!! Thank you! Let me know how it goes if you make it! My roommate and I made this, and it turned out really well! We added some beef chunks to the curry when we made it, and used cut green onions for our ghysal greens. We loved the results! Wonderful! Thank you for letting me know!